Chocolatiers all over the world turn chocolate into an art form. For them, it's simply not enough to create a bar of the sweet delight, or a set of truffles. Though they do that very well too, of course, they instead revel in the making of masterpieces. Impressive 3D creations are becoming increasingly easy to come across, from chocolate replicas of famous landmarks such as Stone Henge, to record-breaking sculptures and even entire rooms made of the stuff. As part of his collaboration with ice-cream makers Magnum, fashion designer Karl Lagerfeld created a chocolate suite complete with a man lying on the bed, who was modelled on his muse and regular catwalk-walker, Baptiste Giabiconi. It was chocolatier Patrick Roger who made it happen, by using a whopping 11 tons of Belgian chocolate. Doesn't it all look fantastic? We're pretty fond of the bed's headboard, which simply looks like a huge bar of chocolate. Delicious. In 2009, Mars' Galaxy started a reading initiative called 'Irresistible Reads'. And what better way is there to celebrate than with a chocolate sofa? With actress Emilia Fox sitting on it accompanied by a good book, the 'studded' quilted panel looks sumptuous, while the silky smooth dark chocolate cushion ticks all the boxes. Combined with the slogan 'Melt into a good book', it's no wonder the campaign was a rip-roaring success. More recently, Ladbrokes Casino has created a chocolate roulette wheel in partnership with Suffolk chocolatiers Artistry in Cocoa. Made up from over 18,000 large chocolate buttons, the creation is a real work of art. There are 438 individual pieces, which have all been crafted with moulds that took an abundance of calculation. 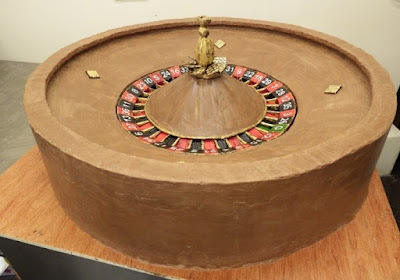 The plywood moulds for the outer and inner rings were designed mathematically in sections, before being filled with plaster of Paris to make two masters which were then used as the patterns to vacuum form plastic moulds for the chocolate. Confused? We are too. But it looks seriously fantastic! We hope our favourites have inspired you to make chocolate sculptures. You don't have to create an entire room, but smaller scale projects couldn't be easier with some moulds and, of course, the chocolate itself.